Sometimes I really want to mix up a tiki drink but realize that I’m missing a good deal of the ingredients to put into one. I usually have limes and lemons around the house, but rarely do I have oranges or grapefruit, or, seriously, passion fruit? Perhaps this means I’m missing variety in my diet? What I end up doing is just deciding to go out to my nearest tiki bar, which on my side of L.A. isn’t too difficult. Today however I ended up with some very late in the season blackberries from the farmers market and was full determined to use them up. In a drink. A tiki drink. Scrounging through the Beach Bum Berry Remixed book, throwing some Martin Denny on the turntable (trying to get into the mood, don’t laugh), I finally came across something I could adapt to what I had on hand- the Hawaiian Eye (created for the 1960’s show of the same name). 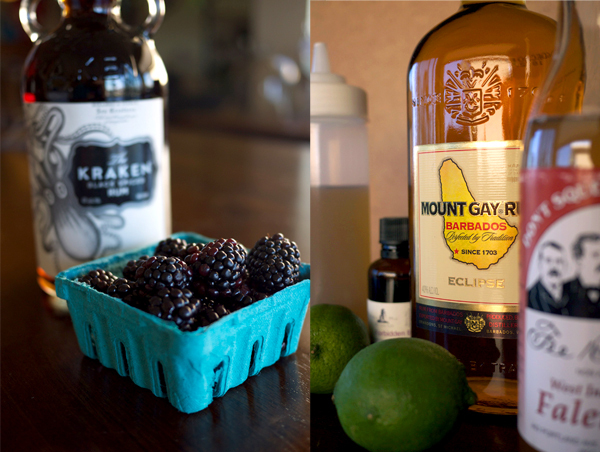 I had some rum, falernum, limes… I just needed the “black eye” part, and those blackberries could fit in nicely. To make the garnish, take your spent lime shell and cut small triangles around the edge. I attempted this with a paring knife first but found that kitchen shears worked much, much better. Pierce the center of the lime with a stainless or bamboo skewer. Thread a blackberry onto the skewer and then the lime shell. Set aside. 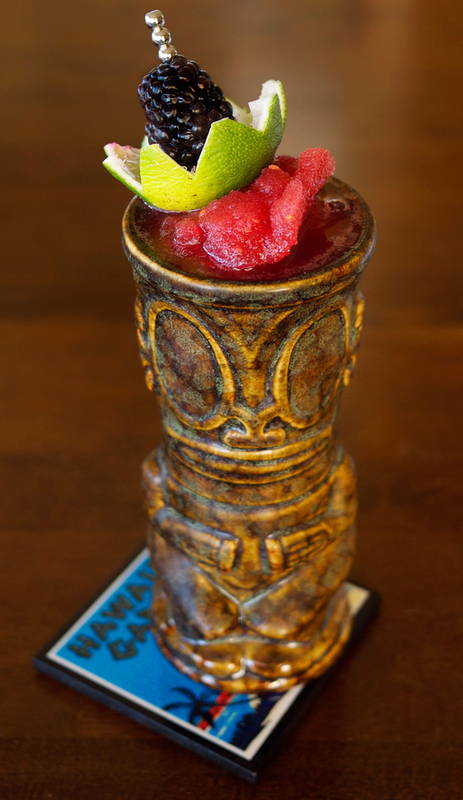 Blend all ingredients and pour into your favorite tiki mug, or a goblet if you have one on hand. Garnish with the blackberry hat. *A note on blackberries. These guys have lots of SEEDS. First attempt at making this meant spitting out seeds with every sip. To avoid this, mash the blackberries through a fine mesh strainer catching the juice, but leaving the seeds behind. Pour into the blender and follow directions as above. The drink becomes more of a ruby color than black. It’s not too sweet with a sharp tang from the lime and blackberries. The spice from the Kraken and the bitters is more in the finish than in the forward flavor. Oh, and careful, it goes down quick.